HPS Target Rifles Ltd., Britain’s leading competition shooting supply vendor, offers a new sling design that should benefit smaller shooters or those whose rifles have shallow fore-ends. The HPS AKTIV Flex Sling, made of non-stretch, reinforced PVC webbing, is designed to overcome the problems of the sling fouling on the trigger guard or rubbing on the underside of the stock. 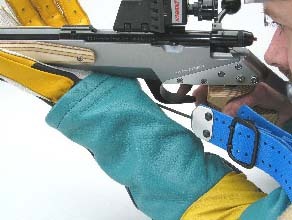 The section of the sling that runs under the rifle is replaced with coated wire. The wire center section can be positioned directly under the stock to give maximum clearance. The front strap can be adjusted to the size of hand and to clear the wrist. 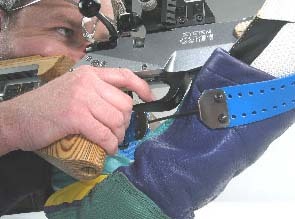 The arm cuff can be adjusted in length for arm size and position, while sling length is controlled by a buckle that positions the ‘tail’ of the sling so that there is no fouling under the rifle. 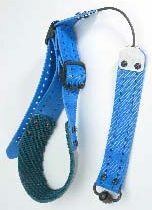 The HPS AKTIV Flex Sling comes in three colours: blue (shown), dark green and black. The price is U.S. $95.87, or 74.84 Euros. To view more products from HPS Target Rifles, including their innovative System Gemini Modular position stocks, visit www.HPT-TR.com, or click the link below to download the HPS catalog as a .pdf file. 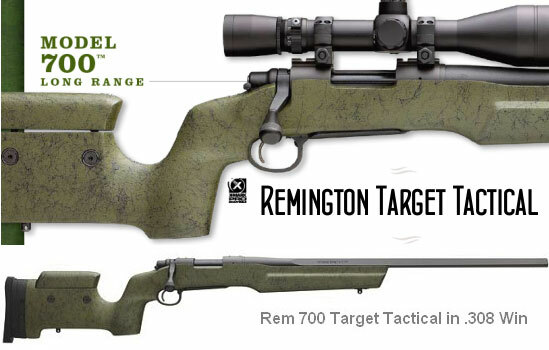 CLICK HERE to Download 10 mb HPS Target Rifles Ltd. Catalog (10 meg .pdf file). Share the post "Two-Part Sling From HPS in Britain"